**groups meet for for 2 hours weekly for 6 consecutive weeks. Tuition is $250 unless marked. ** New students to the DJW should fill out the registration form. We try to work with students scheduling needs while making sure you are in an appropriate level class/combo. Combos: Groups are led by a “coach” and work on a handful of jazz standards (swing, bebop, latin rhythms, ballads, ¾ ) exploring melodies, improvising over chord progressions, learning common intro’s and ending’s, “trading with drums” and other facets of small group jazz. Groups are generally comprised of horns, piano and/or guitar, bass and drums. We have a number of combos running each round from beginner level to advanced. The DJW will consult with new registrants on finding the appropriate level combo. Beginning Improvisation: a course that covers the fundamental info and skills needed to join a combo. Usually a good place to start at the DJW if you haven’t played in a group before. The class covers basic jazz theory including chord symbols, scales and arpeggios, basic chord “voicings” for pianists and guitarist and several approaches to improvising. Students will play in each class using some common jazz standard lead sheets. The class is open to horns, piano, guitar and string players. Advanced Improvisation: a course that analyzes solo transcriptions of a variety of jazz luminaries, analyzes harmonic structures of songs and more advanced harmonic concepts such as major and minor II V I’s, altered and diminished scales, chromaticism and embellishments. Students will have transcribing assignments and learn several approaches to help incorporate the above in your playing. Vocal Combo: for singers who haven’t had a lot of experience working with a rhythm section, but who do have a good knowledge of standard jazz vocal repertoire. Vocalists work with a “coach” in finding ideal “keys” of songs as well as crafting arrangements on tunes and learning to convey them to the rhythm section players. We only accept 4 vocalists into the class so each singer gets ample time to work with the group. Vocal Class: The class caps at 4 singers, each taking turns working with a guitarist/accompanist. It’s a good class for students who do know some of the common standard vocal repertoire, but aren’t ready to join the vocal combo. Great for getting experience singing and listening to other students work out ideas, find ideal keys for chosen songs and work with an chord player. Group Guitar Class: Students learn fundamental skills associated with jazz guitar including basic theory, basic jazz centric voicings, “comping”, learning several standard jazz melodies and rudimentary approaches to improvising. NEW! Jazz Piano for Classical Players: This class is for classical piano players interested in learning about jazz. Subjects will include basic jazz theory, solo piano, piano in a small group setting, learning how to read chord symbols and a jazz “lead sheet”, some basic concepts into how to improvise. The course tries to demystify jazz and improvisation for folks that are used to and comfortable “reading” music. NEW! 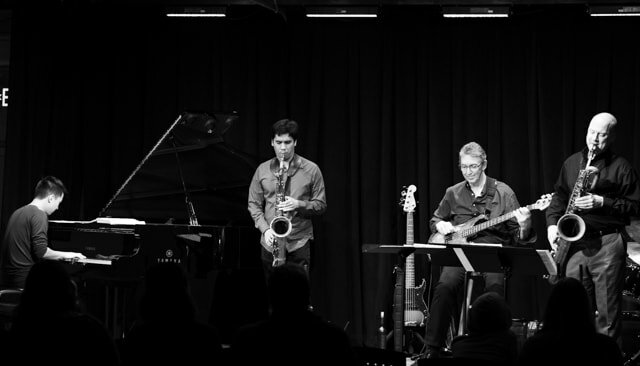 Jazz Composition (small group): Students will compose in various small group jazz styles including blues, contrafacts over standard chord changes and more. Students should be advanced enough to perform each others “works” in class.